BUILD-IT® is a planning and presentation system, which consists of soft- and hardware components. The virtual world is displayed in three-dimensional view and in an overall view by two high resolution projectors. The overall projection is onto the planning table, the three-dimensional view is onto a screen. The navigation in the virtual environment and the manipulation of the virtual objects is done with simple bricks within the overall projection. The "space-observer-box" registers all movements of real objects on the planning table and sends them to the computer. Out of these information the computer calculates the new situation in the virtual world and displays the new image over the two projectors. This procedure is done in real time so that the user can directly interact with the virtual world. Also the camera in the virtual environment is a virtual object that can be manipulated with the brick. This allows to adjust any desired position as well as various inclinations and focal lengths. Walking through the virtual environment in real time is done with the brick and thus becomes very easy. With BUILD-IT® the virtual world is in your hands! The BUILD-IT®system is an ideal planning and presentation tool which allows the team to really work in the virtual world. The user moves in the virtual environment with the use of a real brick and can display his ideas to the other team members three-dimensionally – easy and intuitive. The unique user interface is very easy to use, also from computer non-experts. A real computer supported teamwork is possible because up to 30 bricks can be simultaneously used as an input device. At the BUILD-IT®planning table ideas can be created together with specialists of different subjects. Also the customer plays an important role in the use of the system, because he can be involved in the design process at a very early stage. Misunderstandings and interdisciplinary communication problems are solved since everybody sees the same, talks about the same and works at the same task. With BUILD-IT®unnecessary planning and iteration steps are avoided because all team members can immediately integrate their knowledge during the planning session. Thus possible failures and problems can be easily solved. The fascinating possibilities of BUILD-IT® help to present ideas and products and to perform customers contacts interactively. The high demands and expectations on modern planning teams require new ways of thinking and working for team members. The virtual product and the virtual factory are not only slogans but describe processes to react quickly to the individual and rapidly changing requirements of the market. Traditional planning tools are difficult to adapt to the new planning processes and thus leave innovation potential unused. BUILD-IT® offers new ways for communication and planning. The new and patented way of interacting with the planning system allows and support an interactive teamwork. No CAD specialists are needed anymore for planning purposes and all team members can simultaneously plan and present their ideas. BUILD-IT® offers new possibilities to use virtual reality as an impressive and convincing tool. Customer advices and sales work can be performed in an other dimension by interactively discussing all questions about a product together with the customer in the virtual environment. 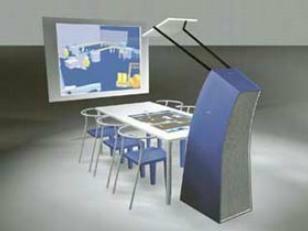 BUILD-IT® can be used as an information or presentation system on exhibitions or in the reception room of a company. BUILD-IT® is an eye-catcher and shows the progressiveness of a company. BUILD-IT® opens the door to efficient planning and presenting in virtual reality! The customer contacts the planning team with a paper based outline (apartment, office, exhibition booth, factory hall). The planning can start immediately. The outline of all virtual objects is directed projected onto the paper based outline on the table. Using the intelligent wall objects of the BUILD-IT® system the important walls are easily re-modelled. The three-dimensional projection allows then a realistic representation of the room. During a first contact with the customer the requirements list for the planning tasks is created, all necessary data (2D, 3D, photographs, sketches) are now available. Using these information the planning team creates and or more solutions, which are presented with the BUILD-IT® system during the next meeting. The customer can see these solutions three-dimensionally and can discuss them with specialists, he can also make some changes or optimizations by himself. The knowledge of the experts is integrated into the planning process and thus problems can recognized and solved. Interesting intermediate results can be printed out and stores to be used for a further processing later on. Planning can be performed interactively, also with team members of different disciplines. BUILD-IT®is easy to use. The system supports the teamwork and uses synergies. Even complex projects are easy to understand for all team members thanks to the three dimensional view. Using BUILD-IT® the number of iterations can be reduced, planning becomes more efficient and decisions can be made earlier. BUILD-IT®support the creativity and ideas and products can be effectively presented in an interactive virtual environment. Many products are manufactured on the customer’s demands. BUILD-IT®enables the sales office to present the product to the customer before it is manufactured. Very often the exhibition of large products is very expensive and needs a lot of space. With BUILD-IT® an unlimited number of products can be presented in a fascinating way. At the same time the system is very attractive to the visitors of an exhibition.